Audrey is a 2006 Southern Aroostook Community School graduate. After graduating high school she attended UMPI to study secondary education focusing on mathematics and was able to complete her first year right at Houlton College. However, after 1 1/2 semesters (45 earned credit hours), Audrey decided to follow in her fathers foot steps "per say" and learn the Electrical Trade transferring to NMCC in the spring of 2008. 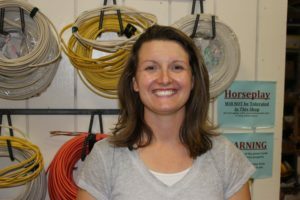 Audrey graduated from NMCC in 2010 with an Associates Degree in Electrical Construction and Maintenance and started working in Lincoln, ME right away for Larry Ham Construction. While working in Lincoln, Audrey worked in residential, commercial, and industrial settings doing electrical work. In the spring of 2011, Audrey and her father started their own business, MCA Electric, so that work could be closer to home and she could start a family. As a female in a nontraditional trade, Audrey is looking forward to sharing her journey with students at Region Two and encouraging them to strive for what they want to accomplish.